Willey Raithby is one of the men named on the Bottesford ‘church list’ of WW1 Servicemen. He was one of three brothers who fought in WW1. His older brother Private Frank Raithby DCM served in the Canadian but sadly Died of Wounds on the 6th October 1918. Edgar Raithby was Killed in Action on the 17th October 1917 when serving with the Machine Gun Corps in East Africa. Thomas W. Raithby was born on the 21st September, 1882, at Hogsthorpe, near Spilsby in Lincolnshire. He was the eldest son of Charles and Ellen Raithby who were married at Spilsby in 1880. Charles was born in 1853 at Strubby, Lincolnshire, and Ellen was born at Colsterworth in 1859. In 1891 the Raithby family were living in Bottesford, where Thomas was attending school. In addition to Charles and Ellen, the family consisted of Nellie (aged 9), Thomas W. (8), Frank (7), Ernest (4), Bertha (3) and an infant named Mabel. 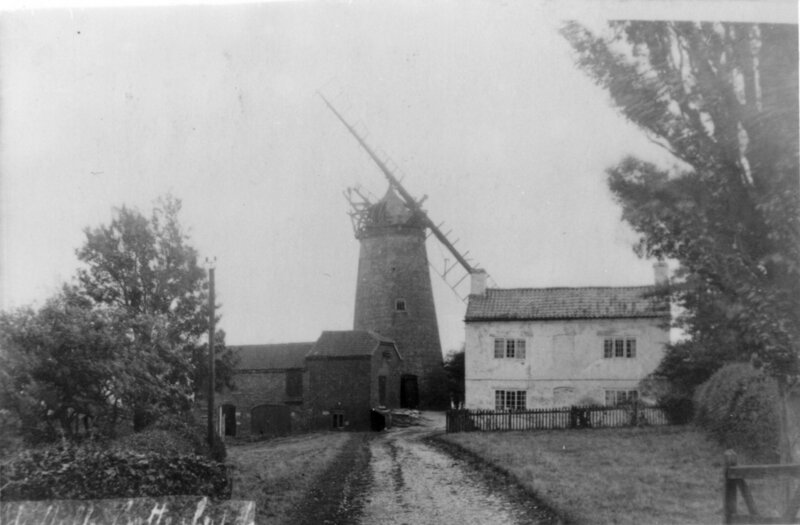 The family lived at Scrimshaw’s Mill by the Grantham Canal where Charles Raithby worked as a miller and baker. He employed and boarded 20 year old Thomas Keyworth as a miller and baker (servant) and 17 year old Rose Sheppard as a domestic servant. Charles and Ellen went on to have three more children, Elsie May in 1893, Edgar Charles in 1894 and Evelyn in 1896. In 1901 Willey Raithby, aged 19, was a servant at the home of Mr John Bell on the Main Road, Long Bennington. Mr Bell employed him as a butcher’s apprentice. It appears that he completed his apprenticeship and had acquired his own butchers shop in Nottingham as early as 1910, as indicated by Wright’s Directory of Nottingham, 1910. His business evidently did well. In January 1913, and again in November 1914, he was recruiting an experienced butcher for the Radford Road business (Nottingham Evening Post 20th January, 1913; Nottingham Journal 18th and 19th November, 1914). In the 1911 census, Thomas Willey Raithby was described as a single man, a butcher by trade, working and living at 241 Radford Road, Nottingham. On census day, he was being visited by his brother Ernest, now a 24 year old railway clerk, and sister Nellie, aged 29, an assistant teacher. His sisters Mabel and Elsie May also went on to become teachers. Thomas Raithby married Ada Hall on 21st April 1913 in Spilsby. They lived at 241 Radford Road, ‘above the shop’, and went on to have three children, a daughter Winifred Kathleen, known as Kathleen, in 1915, a son Richard Willey Raithby on the 16th November, 1916, and another son Norman Victor, known as Victor, on the 17th November, 1924. A Thomas William Raithby with the correct birth date served in the Royal Naval Volunteer Reserve as an able seaman. His division was in Bristol as denoted by his service number Z6342. His RNVR record sheet confirms that Thomas William Raithby, master butcher, b.Hogsthorpe, Lincs, served in the RNVR as Z/6342 from the 14th July 1942, at Victory IV from where he was discharged on the 6th January 1919. It would appear that men conscripted in to the later stages of the war were assigned to the Royal navy with little choice in the matter. HMS Victory IV was a shore establishment, probably the Accounting Section at Portsmouth, which in 1919 moved to Crystal Palace. He was awarded the British Medal and the Victory Medal. After the war, Thomas Raithby returned to his butchers shop and over time the business grew and added a second shop at 33 Highbury Road, Bulwell (Nottingham Journal, Friday 12th July 1935). 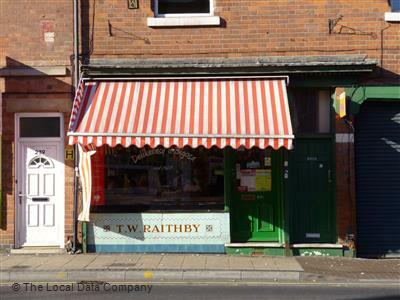 In 1941, Kelly’s Directory records that the Thomas W Raithby butchery business had three shop premises – 33 Highbury Road Bulwell, 241 Radford Road Nottingham and another at 159 Birkin Avenue, Nottingham, and a slaughterhouse in Cornhill Street. Thomas was an active member of the Nottingham & District Butchers Association (which served almost 200 members). He became its President in 1934, and was given a gold medallion in recognition of his good services to the association at the end of his year in office (Nottingham Evening Post 4th October 1934 & 6th February 1935). In 1935, at a time when concerns were being raised about the standards in slaughterhouses, he was advertising in a public notice inviting inspection of his slaughterhouse, lairage, refrigerator cellars and shops. He said, “My cattle and sheep are transported from the market by motor float, rested in cool pens and dispatched humanely under hygienic conditions. Cleanliness is my pride and service to the public my speciality” (Nottingham Journal Friday 12th July 1935). He was also active in the Nottingham Bohemians, a social group raising money for charity. 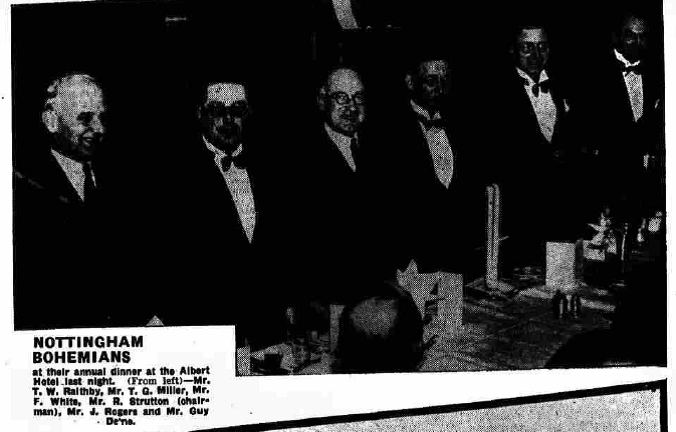 In the picture he is 1st on the left (Nottingham Evening Post Tuesday 22nd March 1938). In 1936 Thomas Willey Raithby was described as a city council aspirant and invited to stand as a conservative candidate in Sherwood ward (Nottingham Journal Wednesday 2nd September 1936). However, to date no evidence has been found to suggest he was successful in the election. In 1937, he donated a beautifully bound hymn book for use in the Bottesford Methodist Chapel pulpit, in memory of his father and mother who were worshippers at the chapel. It was presented at a musical service in the Chapel on Chapel Street, Bottesford (Grantham Journal Saturday 6th March 1937). In 1939, T.W. Raithby became actively involved in the successful legal appeal brought by Nottingham slaughterhouse after Nottingham Corporation had refused to renew many slaughterhouse licences. In the newspaper report it was stated that his business was at 246 Radford Road but that his slaughterhouse was in Cornhill Street Nottingham (Nottingham Journal Saturday, 29th July 1939). During the Second World War he was prosecuted for breaching blackout regulations at his shop on 241 Radford Road and in 1940 was fined £2 10s. His son Richard had worked in the family business as a butcher before joining up in 1940. He served overseas from July 1942, and was a Post-Orderly in the RAMC. He entertained troops around Cairo as an army comedian (Nottingham Evening Post 1st February 1944). Thomas Willey Raithby was living in Highbury Road Bulwell when he died at the Pay Bed Wing of the General Hospital Nottingham on 22nd October, 1944, aged 62 (National Register of Deaths, and Nottingham Evening Post 24th & 25th October 1944). He was buried in Bulwell cemetery Nottingham on 26 October 1944 (Deceasedonline.com). Administration of his will was granted to his solicitor, his son Richard, also a butcher, and his daughter Kathleen Winifred Raithby, spinster. The National Probate Calendar records that he left effects of £11,955 4s 6d. Thomas’s widow Ada died in March 1961, aged 74. The butchery business was still trading at Radford Road and Highbury Road Bulwell as late as 1966 (entries in the 1966 Telephone Directory) and its tiled frontage can still be seen at the Radford Road premises on Google Maps street view, though it is now a continental meat products business. The fourth son, Ernest Raithby, was born on the 26th March 1887, and appears to have worked on the railways all his life. In 1911, he was recorded as a railway clerk in the census. On the 9th May, 1912, he married Maud Matilda Martha Creek at Bottesford. It is uncertain if they had children. Electoral rolls indicate that in 1924 Ernest and Maud lived at the Station House at Pye Hill, Selston, Notts. Pye Hill is a small village in the Ashfield District, the site of former coal mine. The roll for 1930 recorded the couple at the Station House at Rippingale, Lincs. Then the 1939 register has them at the Station House at Market Rasen, Lincs, where Ernest was the Station Master. Ernest Raithby died at Claro, North Yorkshire, in 1969, aged 82. No military record or medal index card have been found, and so it is possible that he was exempted from service during WW1.